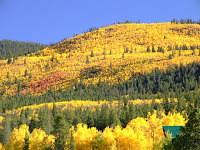 The fall foliage is in its full peak season right now in Breckenridge, CO and the surrounding high country areas. The shimmering golden yellows of the Aspen trees against the brilliant bluebird skies are absolutely spectacular. Now is the time to go color touring in the high country, and here are a few suggestions we have for Breckenridge and Summit County. Book your fall foliage stay online now and you can save up to 33% on Breckenridge lodging! For some of the best viewing of the peak fall foliage, first drive Boreas Pass located on the south side of Breckenridge. This historic road was originally designed for the Pacific Railroad as the silver boom in Leadville necessitated this high railroad pass over the Rocky Mountains. At the top of the pass, you can see the few remainders of the Boreas Railroad station. If you continue to the other side of the pass, you can loop around through the town of Fairplay, Colorado and return to Breckenridge by Hoosier Pass. This makes one big loop of high-altitude fall colors and spectacular views. When you come down off of Boreas Pass, you will be in Como, Colorado. If time allows, you can take CO HWY 285 on a twenty-minute drive that will take you to the top of Kenosha Pass, where the colors are spectacular this year! On your way down, stop for lunch or dinner at the historic Como Depot. This restored train depot is a blast from the past that offers delicious cuisine with great prices. Mention you are with ResortQuest Breckenridge and get a dining deal! After an incredible day in the mountains, return to Breckenridge to view the amazing golden yellow backdrop surrounding the town. When you stay with ResortQuest Breckenridge you can save up to 33% for a 3-night stay or longer. If you can't stay 3 nights we will still give you 25% off your 2-night stay! Don't miss fall in the high country! Book your stay now.